Austrian pianist, composer and teacher (1791-1857). 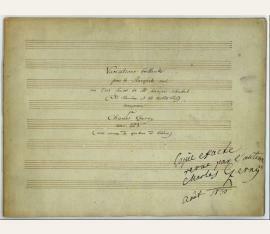 Musical manuscript with autograph inscription and signature. No place. Oblong large 4to. 25 pp. (incl. title page) on 13 pp. 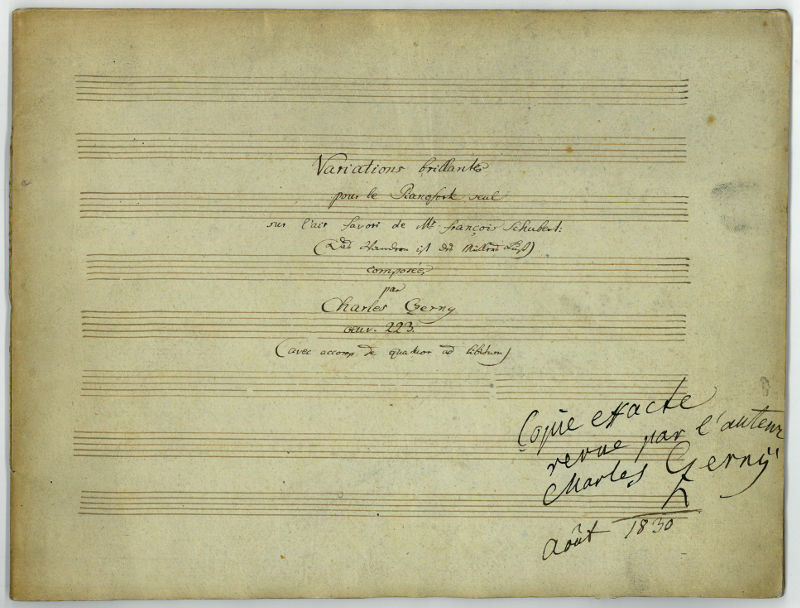 "Variantions brillantes | pour le Pianoforte seul | sur l'air favori de Mr Francois Schubert | (Das Wandern ist des Müllers Lust) | composée | par | Charles Czerny | oeuv. 223 | (avec accomp. 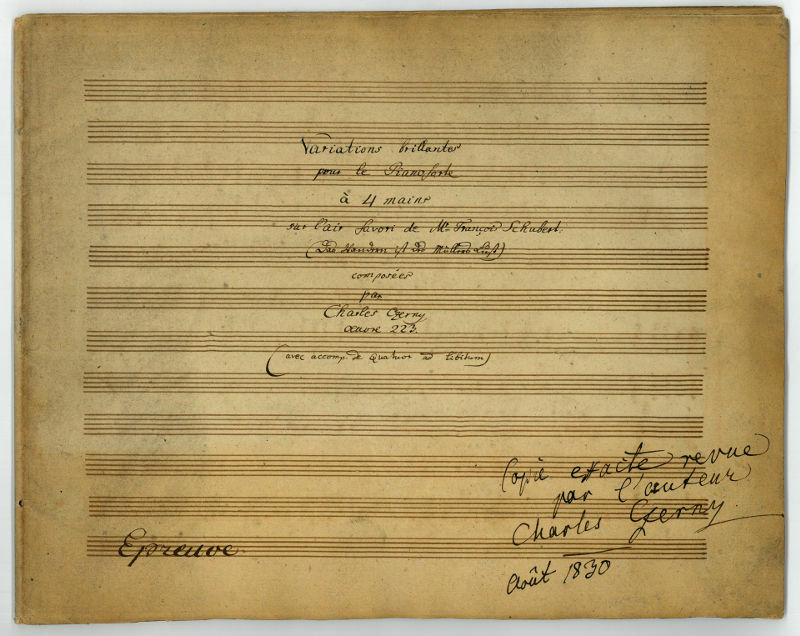 de quatuor ad libitum)": "Copie exacte | revue par l'auteur | Charles Czerny | aout 1830". - In fine condition. Austrian pianist, composer and teacher (1791-1857). 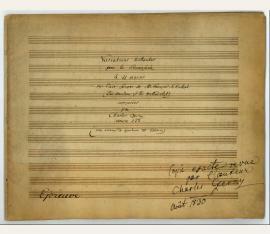 Musical manuscript with autograph inscription and signature. No place. Oblong large 4to. 24 pp. (incl. title page) on 12 pp. "Variantions brillantes | pour le Pianoforte | à 4 mains | sur l'air favori de Mr Francois Schubert | (Das Wandern ist des Müllers Lust) | composée | par | Charles Czerny | oeuvre 223 | (avec accomp. de quatuor ad libitum)": "Copie exacte revue | par l'auteur | Charles Czerny | aout 1830". - In fine condition. Carl Czerny (1791-1857), pianist, composer, famed music teacher, student of Beethoven. AMusQS. Vienna, 13 August 1856. 1 p. 4°. With autogr. dedication. Vocals: "Wer den Bessten seiner Zeit genug gethan, der hat gelebt für alle Zeiten" ("He who has satisfied the best men of his time has lived for all ages"; quoting Friedrich Schiller's "Wallenstein"), set to piano music. Eight bars "Moderato" in F major, in two staves, with the words written above the notes. 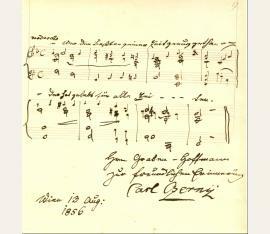 With dedication in German below: "To Mr. Grabner-Hoffmann | may he remember me kindly | Carl Czerny". Written in the year before his death, with a broad pen. Fine, attractive quotation. 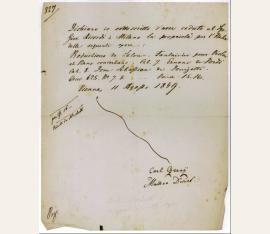 Contract on buying the copyright of "Productions de Salon. Fantaisies pour Violon et Piano concertans" (from Verdi's "Ernani") and Donizetti's "Dom Sébastien" from Giovanni Ricordi. Countersigned by the Austrian violinist, violist and composer Matthias Durst ("Matheo Durst", 1815-1875). - Some damages to edges and slightly spotty.